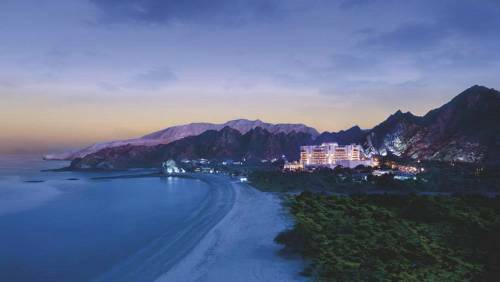 Travelling Actuary Eve Hartridge takes us to Oman, one of the most beautiful and mythical regions of The Arabian Peninsula. It is also a country that very few people can find on a map. As a travel writer I often get asked where I'd love to return to or where is the best place that I've visited. My answer every time is Oman and it is genuinely true. I first travelled to Oman in 1997 with a friend who had family based there with The British Army and that day in early March is still my greatest globetrotting adventure to date. In 1997 my life was full of such possibility but such convention having recently left home to fend for myself at university. The only travel I had really experienced had been in the form of family holidays to France or long summers spent in New England with a friend from boarding school. Oman was on a par with the moon for me, I had absolutely no idea what it would be like. After boarding the aircraft there was no turning back, crammed into the back of economy all the way I could smell stale cigarette smoke, we touched down in Saudi Arabia where I had my glossy magazine confiscated and the plane was fumigated, the next stop was Dubai where most passengers disembarked leaving me and very few others to complete the journey onto Muscat. When we arrived and the doors were opened the heat almost overwhelmed me. I love warm weather but this was something quite extraordinary. The smell of baking tarmac, hot engines and melting tar is something I can recall with such clarity even today. In the arrival hall everything was written in Arabic, I could only guess where to go from the pictures. In passport control I was nervous to go through alone, immediately concerned that there would be a problem with my visa. Everywhere smelt of cigarettes, the first time I heard "call to prayer" I wondered what was happening, I was very aware that I was not dressed like the other girls whose looks lingered on me followed by nervous laughs and embarrassed smiles. I stood outside waiting to be collected in the sweltering heat, noticing the brilliant blue sky, white washed flat roofs and the baron beige landscape, there was nothing green in sight. I thought that my senses were deceiving me; Oman had quite simply taken my breath away. Returning to Oman was a very different experience, I knew that it wouldn’t have such a profound impact on me but instead it was like visiting an old friend. The flight this time was direct, no-one was smoking and this wonderful country had managed to retain so much of its original charm and culture but was now ready to receive me as tourist. Oman is growing in popularity as a holiday destination; the centres of Muscat and Salalah are both worth exploring and are only separated by a short internal flight. International flights arrive into the capital of Muscat and it makes sense to be based here for a first visit. In 1997 the best hotel in town was The Al Bustan Palace, indulgent in every sense, the whole of the top floor remained permanently reserved should The Sultan require it. The interior lobby with decadent fountain and luxurious raw silk seating was the place to been seen taking afternoon tea. Today, little has changed; the hotel is part of The Ritz Carlton Group and comfortably maintains its five star status. The hotel is grand in every sense with 250 rooms and suites all are spacious and well appointed, the gardens immaculately maintained with lush flora and manicured lawns. Guests can enjoy a mountain, poolside or private beach view and there are numerous dining options at The Al Bustan with "Al Kharin" a favourite for all day dining. Visitors will not struggle for choice from breakfast banquets to buffet suppers the selection on each cooking station is extensive. In Salalah the options are a little more limited, however there is little wrong with the Hilton which was one of the first large hotels to be build in the town. The hotel has been established for around fourteen years and has built a good reputation in this time, food is excellent and the staff outstanding. The hotel sits right on the beach which is generally empty apart from the odd camel. Traders Vic's at The Intercontinental in Muscat is popular every day of the week. The bar serves great cocktails (worth noting that anywhere serving alcohol rarely mixes singles) and there is often live music. The food is generally western with a few Asian dishes which are tailored to an ex-pat pallet. Fully air-conditioned with great service, dress up and enjoy the whole experience which will take you dancing into the early hours. 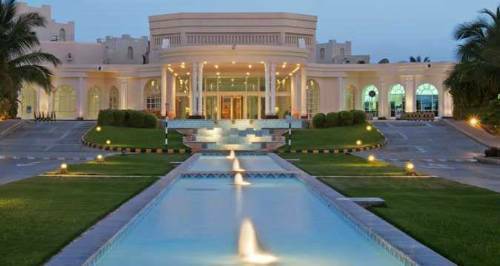 Shiraz at The Grand Plaza Hotel in Muscat offers beautiful food and beautiful views. This is a traditional Iranian restaurant which is a very good introduction to Middle Eastern Cuisine. Many of the dishes contain lamb which has been slowly cooked to perfection. The vegetarian selection is a little limited however the side dishes of freshly cooked break and vegetables were plentiful. The Restaurant at The Chedi in Muscat is the current "go to restaurant" tailored to the tourist the setting is pure stylish luxury. A variety of cuisine is available and all is beautifully presented as one would expect in a Michelin Starred restaurant. Dining here is very much an experience to sample "the art of food". In Salalah try Bawarchi, although do not be put off by the surroundings! Choices are a little limited in this area of Oman however this restaurant serves excellent food, mainly Indian. The service is a little slow, but the food is well worth waiting for. Bawarchi also offers excellent value for money with plentiful main courses costing the equivalent of £3. Oman is very safe and the people very friendly. It is such a fantastic country to explore and most people speak a little English, even in more remote areas. The religion of Oman is Islam and therefore it is recommended that visitors dress respectfully especially if sight seeing around the mosques. 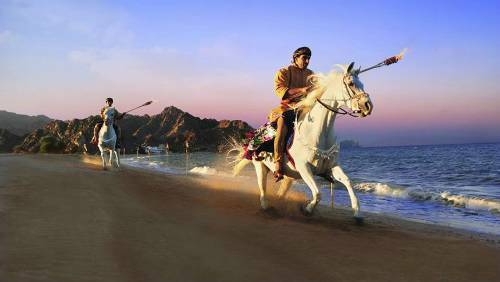 Oman has many ancient defence castles and forts, and close to Muscat is the most popular, Nizwa which dates from the 17th century. Nizwa is popular with tourists and well restored for this reason, there are good on-site facilities and an authentic silver souk. Many firms run organised tours and to be honest, hiring a car and seeing Nizwa independently can be preferable during the very hot summer months, just be careful not to hit any camels. Bahla Fort lies to the north of Muscat and is well worth a drive as it is now recognised as a UNESCO World Heritage Site with over seven miles of fortress walls. Desert safaris and dune bashing are part of the programme for any trip to The Middle East; however, unlike Dubai the desert in Oman is a lot less commercial and the trip a little more thrilling. Wahiba Sands in the North are the most popular and the sand dunes are huge. Often not for the faint-hearted, especially is accompanied by tales of Camel Spiders. For a more peaceful 4x4 trip, head up to the Hajjar Mountains, the highest point of Oman and explore the traditional villages. Anyone familiar with the stories of Abi Baba will know what a Dhow is and although there is no certainly that the stories were based in Oman this is the traditional boat of the country. Dhow cruises are popular and often include fishing trips and dinner. If you're lucky you may also see some of the wildlife that includes giant sea turtles and dolphins, this is the edge of The Indian Ocean after all. In both Muscat and Salalah it is worth experiencing the souks which come to life in the early evening. Gold and silver is well priced and vendors expect you haggle, you'll notice that the gold is a slightly different shade to western jewellers so it's worth asking what grade it is. 14 carat and 22 carat are common in The Middle East. Many of the markets smell of Frankincense which is widely available to buy and far cheaper than when bought in Europe, it is quite an acquired scent. Colourful fabric and tailoring is popular in Oman, seek guidance on this as hotel concierges are often well placed to give recommendations. The symbol of Oman is a small dagger or "Khanjar" and many markets sell them as solid silver keep sakes in presentation frames, a great reminder of your trip. Oman Air fly daily from London Heathrow to Muscat in a time of around seven and a half hours, return times can vary by up to half an hour depending on conditions. Oman Air prides itself on having one of the most exclusive first class cabins with just six seats or "Mini Suites" as they are referred to. Each guest will enjoy a la carte dining, a 23 inch television screen and a luxurious massage seat which becomes a flat bed, currently the longest available on a commercial plane. There is no better way to reach Oman, unless it is by private jet.